Contemporary style and great comfort in this recliner and ottoman set will be perfect in your living room. 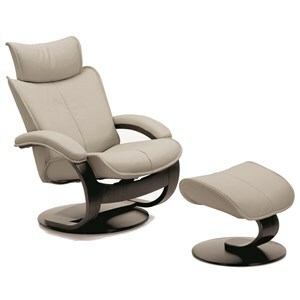 Supported by a swiveling pedestal base, the recliner has an adjustable headrest that accommodates people of all heights. Kick your feet up at the end of the day on the footstool with a stylish pedestal base. The Ona Contemporary Large Recliner and Ottoman with Adjustable Headrest by Fjords by Hjellegjerde at Furniture Superstore - Rochester, MN in the Rochester, Southern Minnesota area. Product availability may vary. Contact us for the most current availability on this product. Browse other items in the Ona collection from Furniture Superstore - Rochester, MN in the Rochester, Southern Minnesota area.